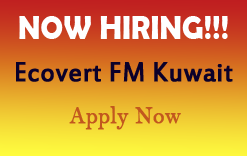 Home > Kuwait Jobs > Latest Job Vacancies in Ecovert FM Kuwait - Apply Now! Latest Job Vacancies in Ecovert FM Kuwait - Apply Now! Ecovert FM Kuwait (EFMK) was established in partnership with Bouygues Energies and Services, Ahmadiah Contracting & Trading Company and Ajial Real Estate and Enterntainment Company to provide facilities management services within Kuwait. The core business of EFMK is the management and delivery of integrated facilities management services. For each contract we aim to manage and deliver our contracted services by the direct employment of all operational, management and support staff. All candidates should have previous experience in relevant field. Accommodation, Transportation and other Benefits as per Kuwait labour law.